The United States District Court for the Eastern District of Virginia unsealed the indictment Monday against Wikileaks founder Julian Assange. I, Megan Brown, make this affidavit in support of a criminal complaint charging the defendant, Julian P. Assange, with violating 18 U.S.C. §371 by conspiring to (1) access a computer, without authorization and exceeding authorized access, to obtain classified national defense information in violation of18 U.S.C. § 1030(a)(1); and (2) access a computer, without authorization and exceeding authorized access, to obtain information from a department or agency of the United States in furtherance of a criminal act in violation of18 U.S.C. §1030(a)(2), (c)(2)(B)(ii). 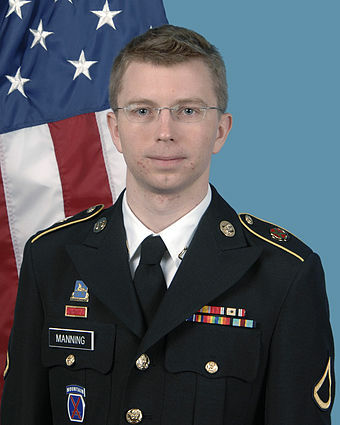 Army photo of US Army PFC Bradley Manning in 2012. Manning now goes by the name of Chelsea. I am a Special Agent with the Federal Bureau of Investigation (FBI) and have been so employed since February 2011. The facts in this Affidavit are based on my personal observations, information obtained from other agents and witnesses, my training and experience, and my review of records, reports, articles, and websites. Unless otherwise noted, information provided to me by other law enforcement personnel does not necessarily reflect my personal observations or investigation, but rather has been passed to me by individuals with first-hand knowledge. This Affidavit does not set forth all of my knowledge about this matter but is intended merely to establish probable cause for the criminal complaint. As shown below, the conspirators took elaborate measures to conceal their communications, mask their identities, and destroy any trace of their conduct, using, for example, encryption and anonymization techniques, and erasing and wiping data. For this reason, the facts are derived in large part from forensic analysis of available computer data, remnants, or unalterable systems. These charges relate to one of the largest compromises of classified information in the history of the United States. Between in or around January 2010 and May 2010, Chelsea Manning, an intelligence analyst in the U.S. Army, downloaded four, nearly complete and largely classified databases with approximately 90,000 Afghanistan war-related significant activity reports, 400,000 Iraq war-related significant activity reports, 800 Guantanamo Bay detainee assessments, and 250,000 U.S. State Department cables. Manning provided these records to WikiLeaks, a website founded and led by the defendant, Julian P. Assange. On its website, WikiLeaks expressly solicited classified information for public dissemination. WikiLeaks publicly released the vast majority of the classified records on its website in 2010 and 2011. Manning has since been tried and convicted by court-martial for her illegal acts in transmitting the information to WikiLeaks. Manning said she gave WikiLeaks the July 12, 2007, Baghdad airstrike video in early 2010. The charges in this criminal complaint focus on a specific illegal agreement that Assange and Manning reached in furtherance of Manning’s illegal disclosure of classified information. As explained below, investigators have recovered Internet “chats” between Assange and Manning from March 2010, The chats reflect that on March 8, 2010, Assange agreed to assist Manning in cracking a password stored on United States Department of Defense (DoD) computers connected to the classified Secret Internet Protocol Router Network (SIPRNet). Manning, who had access to the computers in connection with her duties as an intelligence analyst, was using the computers to download classified records to transmit to WikiLeaks. Cracking the password would have allowed Manning to log onto the computers under a username that did not belong to her. Such a deceptive measure would have made it more difficult for investigators to determine the source of the illegal disclosures. While it remains unknown whether Manning and Assange were successful in cracking the password, a follow-up message from Assange to Manning on March 10, 2010, reflects that Assange was actively trying to crack the password pursuant to their agreement. Circumstantial evidence reflects that Assange and Manning intended to crack the password to facilitate Manning’s illegal disclosure of classified information. At the time they formed their illegal password-cracking agreement, Manning had already provided WikiLeaks with hundreds of thousands of classified records relating to, among other things, the wars in Afghanistan and Iraq. In the recovered chats surrounding the illegal agreement. Manning and Assange engaged in real-time discussions regarding Manning’s transmission of classified records to Assange. The chats also reflect the two collaborating on the public release of the information and Assange actively encouraging Manning to provide more information. The chats, moreover, reflect that Manning actively took steps to try to conceal herself as the source of the leaks. Thus, the context of the agreement demonstrates that Assange and Manning intended to crack the password to facilitate Manning’s disclosure of classified information of the United States. Chelsea Manning pictured in a photograph published to her Twitter account on 18 May 2017. According to Manning, she began helping WikiLeaks soon after WikiLeaks publicly released messages from the September 11, 2001 terrorist attacks on November 25, 2009. As the examples in the following two sections demonstrate, Manning transmitted a large amount of classified information to WikiLeaks prior to March 2010, which was when she formed the agreement with Assange that is the subject of this complaint. During her court-martial proceedings. Manning has admitted that, prior to March 2010, she provided WikiLeaks with classified significant activity reports from the Iraq and Afghanistan wars (“Iraq War Reports” and “Afghanistan War Reports,” respectively). According to Manning, she downloaded the Iraq War Reports and Afghanistan War Reports from the relevant CIDNE databases in late December 2009 and early January 2010, and initially saved the records on a CD-RW that she kept in her SCIF. Manning admitted that she later took the CD-RW out of the SCIF and copied the data from the CD-RW onto her personal laptop. Manning stated that she transferred the data from her laptop to a Secure Digital (“SD”) memory card, which she took with her when she went on leave later in January 2010. Items of Historical Significance for Two Wars: Iraq and Afghanistan Significant Activities (SIGACTs) between 0000 on 01 JAN 2004 and 2359 on 31 DEC 2009 (Iraq local time, and Afghanistan local time) CSV extracts are from the Department of Defense (DoD) Combined Information and Data Exchange (CIDNE) Database. It’s already been sanitized of any source identifying information. You might need to sit on this information, perhaps 90-180 days, to figure out how best to release such a large amount of data, and to protect the source. This is possibly one of the more significant documents of our time, removing the fog of war, and revealing the true nature of21st century asymmetric warfare. Have a good day. According to Manning, she uploaded the Iraq War Reports, Afghanistan War Reports, and README.txt file to the WikiLeaks website on or around February 3, 2010. WikiLeaks publicly released the Iraq War Reports and Afghanistan War Reports on its website later in 2010. In July 2010, WikiLeaks released approximately 76,000 of the Afghanistan War Reports. Then, in October 2010, WikiLeaks released approximately 391,832 Iraq War Reports. Manning and WikiLeaks had reason to believe that public disclosure of the Afghanistan War Reports and Iraq War Reports would cause injury to the United States. Documents included in the Afghanistan War Reports contained information the disclosure of which potentially endangered U.S. troops and Afghan civilians, and aiding enemies of the United States. Numerous Secret reports, for example, related to the identity and significance of local supporters of the United States and Coalition forces in Iraq and Afghanistan. Moreover, on May 2, 2011, United States government officials raided the compound of Usama bin Laden in Abbottabad, Pakistan. During the raid, they collected a number of items of digital media, which included, among other things, (1) a letter from bin Laden to another member of the terrorist organization al-Qaeda in which bin Laden requested that the member gather the DoD material posted to WikiLeaks, and (2) a letter from that member of al-Qaeda to Bin Laden with information from the Afghanistan War Reports released by WikiLeaks. In addition, some of the Afghanistan War Reports included detailed reports of improvised explosive device (“lED”) attacks on the United States and Coalition forces in Afghanistan. The enemy could use these reports to plan future lED attacks because they described lED techniques, devices, and explosives, and revealed the countermeasures used by the United States and Coalition forces against lED attacks and potential limitations to those countermeasures. I have reviewed a number of the Afghanistan War Reports and Iraq War Reports that WikiLeaks released. The reports that I reviewed contained classification markings reflecting that they were classified as “SECRET.” This suggests that the versions of the Afghanistan Reports and Iraq War Reports that Manning transmitted to WikiLeaks clearly reflected that they were classified. In the above-described chats, Manning informed Assange that she had accessed the SAM file with a program and had identified this particular 16-byte hexadecimal value as a potential LM or NTLM password hash. By saying she retrieved the password hash through a “hex dump,” Manning likely meant that she used a software program to view the SAM file in “hexadecimal format,” in which raw computer data can be viewed. Two days later, at approximately 11:30 p.m. on March 10, 2010, Assange followed up on the issue. Assange messaged Manning and asked, “any more hints about this Im hash?” Assange stated, “no luck so far.” Investigators have not recovered a response by Manning to Assange’s question, and there is no other evidence as to what Assange did, if anything, with respect to the password. The next chats that investigators were able to recover were dated March 16, 2010. Thus, there is approximately a six-day gap in the chats after Assange asked for further hints on the hash. Nevertheless, the recovered chats described above reflect an agreement between Manning and Assange to crack the hash. 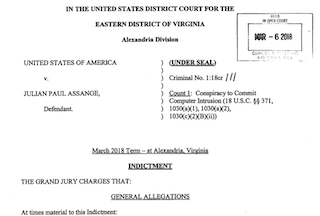 The evidence summarized in this Affidavit establishes probable cause to believe that the defendant, Julian P. Assange, committed the offense alleged in the complaint; namely, Assange violated 18 U.S.C. § 371 by conspiring to (1) access a computer, without authorization and exceeding authorized access, to obtain classified national defense information in violation of 18 U.S.C. § 1030(a)(1); and (2) access a computer, without authorization and exceeding authorized access, to obtain information from a department or agency of the United States in furtherance of a criminal act in violation of18 U.S.C. § 1030(a)(2), (c)(2)(B)(ii). Respectfully submitted, Special Agent Megan Brown Federal Bureau of Investigation. Julian Paul Assange was the founder and leader of the WikiLeaks website. The WikiLeaks website publicly solicited submissions of classified, censored, and other restricted information. Assange, who did not possess a security clearance or need to know, was not authorized to receive classified information of the United States. Between in or around January 2010 and May 2010, Manning downloaded four, nearly complete databases from departments and agencies of the United States. These databases contained approximately 90,000 Afghanistan war-related significant activity reports, 400,000 Iraq war-related significant activities reports, 800 Guantanamo Bay detainee assessment briefs, and 250,000 U.S. Department of State cables. Many of these records were classified pursuant to Executive Order No. 13526or its predecessor orders. Manning provided the records to agents of WikiLeaks so that WikiLeaks could publicly disclose them on its website. WikiLeaks publicly released the vast majority of the classified records on its website in 2010and 2011. Manning, who had access to the computers in connection with her duties as an intelligence analyst, was also using the computers to download classified records to transmit to WikiLeaks. Army regulations prohibited Manning from attempting to bypass or circumvent security mechanisms on Government-provided information systems and from sharing personal accounts and authenticators, such as passwords. The portion of the password Manning gave to Assange to crack was stored as a “hash value” in a computer file that was accessible only by users with administrative-level privileges. Manning did not have administrative-level privileges and used special software, namely a Linux operating system, to access the computer file and obtain the portion of the password provided to Assange. Prior to the information of the password-cracking agreement, Manning had already provided WikiLeaks with hundreds of thousands of classified records that she downloaded from departments and agencies of the United States, including the Afghanistan war-related significant activity reports and Iraq war-related significant activities reports. At the time he entered into this agreement, Assange knew that Manning was providing WikiLeaks with classified records containing national defense information of the United States. Assange was knowingly receiving such classified records from Manning for the purpose of publicly disclosing them on the WikiLeaks website. For example, on March 7, 2010, Manning and Assange discussed the value of the Guantanamo Bay detainee assessment briefs, and on March 8, 2010, before entering the password cracking-agreement. Manning told Assange that she was “throwing everything [she had] on JTF GTMO at [Assange] now.” Manning also said, “after this upload, that’s all I really have got left.” To which Assange replied, “curious eyes never run dry in my experience.” Following this, between March 28, 2010, and April 9, 2010, Manning used a United States Department of Defense computer to download the U.S. Department of State cables that WikiLeaks later released publicly. The primary purpose of the conspiracy was to facilitate Manning’s acquisition and transmission of classified information related to the national defense of the United States so that WikiLeaks could publicly disseminate the information on its website. It was part of the conspiracy that Assange and Manning used the “Jabber” online chat service to collaborate on the acquisition and dissemination of the classified records, and to enter into the agreement to crack the password stored on United States Department of Defense computers connected to the Secret Internet Protocol Network. It was part of the conspiracy that Assange and Manning took measures to conceal Manning as the source of the disclosure of classified records to WikiLeaks, including by removing usernames from the disclosed information and deleting chat logs between Assange and Manning. Cloud drop box of WikiLeaks to transmit classified records containing information related to the national defense of the United States. On or about March 2, 2010, Manning copied a Linux operating system to a CD, to allow Manning to access a United States Department of Defense computer file that was accessible only to users with administrative-level privileges. On or about March 8, 2010, Manning provided Assange with part of a password stored on United States Department of Defense computers connected to the Secret Internet Protocol Network. Whistleblowers throughout the decades have leaked confidential information to news organizations, which have published the documents based on the First Amendment of the Constitution which protects freedom of the press. The Pentagon Papers was one such example. That will have to be proven in a court of law, however, ramifications that this case could have on freedom of the press is mind-boggling. If a journalist meets secretly with a whistleblower to protect the identity of the person giving them the information, can a case be made against the journalist for conspiring with the source to protect their identity? When does a journalist/publisher cross over the line to criminal activity? If someone wants to give me information that is one thing. 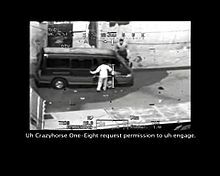 If I have to assist them by breaking into a building or a computer so the information can be accessed, I would say I just became involved in criminal activity. Freedom of the press would not protect me in that case. President Donald Trump praised Wikileaks during his campaign in 2016, telling supporters he loves what Assange did. Fast forward to 2019, Trump now says he knows nothing about WikiLeaks. How that will impact the case against Julian Assange remains to be seen.